Amazon Price: $14.95 $13.08 (as of February 2, 2019 6:57 pm – Details). Product prices and availability are accurate as of the date/time indicated and are subject to change. Any price and availability information displayed on the Amazon site at the time of purchase will apply to the purchase of this product. For Earth's first couple, obedience trumps rebellion then leads to redemption. But what of their children? Seduced by evil, Cain kills Abel then flees with his sister to the land of Nod. 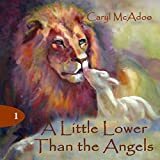 Bereaved of all their children in one day, Adam and Eve are heartbroken…until they see a vision of Abel in paradise with their childhood pets, Lion and Lamb, and Eve finds the strength to wait upon the Lord for His blessing. Though dead on earth, Abel's soul lives on in paradise, resting and learning from the old cherub who God sent to teach the murdered son of Adam. He listens to the war songs the legions of angels sing that battle for his brother and sister, and even his mother's soul. But best of all, the angel elder tells him stories of Heaven and how one day, man and God will be reconciled. Again, the first couple is tested and must wait upon the Lord's blessing to begin again. Can they walk in obedience for 70 long years? And Cain's offering is finally accepted, but by whom? Three parallel storylines offer a new perspective to an age-old story. Adam and Eve in Adam's Valley Cain and Sheriah on their journey east of Eden to Nod Abel in Paradise with visiting angels, including a kindly ancient cherub named Namrel. At the end of the story, a section called Search the Scriptures helps listeners understand where the author got her ideas for the story and encourages them to do their own searches as well.